or at least throw straight often enough to keep fans in the third row safe. They’ll take fliers on skilled but flawed players like Ian Stewart and hope for a late breakout. They’ll even give chances to minor league lifers like Bryan LaHair, shooting for 25 homers dirt cheap while the farm system’s talent ripens. Players will be shopped (Matt Garza, Marlon Byrd), prospects will make their debuts (Brett Jackson), and if all goes well, the Cubs will move one year closer to making a monster free-agent signing make sense. Grantland looks at all 30 teams for the 2012 season. What LaHair lacks in pedigree he makes up for in performance, at least in the minors. LaHair laid waste to the Pacific Coast League last year, blasting 38 homers with a line of .331/.405/.664, prompting the highest projection on the team for this season. DeJesus was a nifty pickup at two years, $10 million, and he’s a good candidate to bounce back from a hit-unlucky 2011 campaign. Soto, just a year removed from a monster 2010 season in which he posted a .385 wOBA, could also see a healthy rebound. There are no stars in this lineup, but there’s enough here to field a competitive offense. The Cubs finished 25th in ERA and 22nd in FIP last year; they’ve got a chance to be a fair bit better this season. Avoiding 16 horror-show starts from Rodrigo Lopez (5.36 FIP in 2011) is a good start. Carlos Zambrano won’t be missed either. In their stead, the Cubs nabbed Maholm (3.66 ERA, 3.78 FIP last year) on a cheap, one-year deal, and took a flier on the skilled but erratic Volstad. The bullpen takes a hit with Sean Marshall gone, but the Cubs got back Travis Wood, who could help the back end of the rotation or the pen. In-season trades of Garza and Dempster would be big short-term setbacks. But as long as the current crew sticks together, this could be a surprisingly functional pitching staff. Wood. He had a great rookie season in 2010, posting a strikeout-to-walk rate better than 3-to-1 over 17 starts. Give him a full year in the rotation and a 4-WAR season isn’t out of the question. A sneaky-respectable team emerges and stays competitive through the All-Star break, making trade-deadline decisions at least slightly tougher for the new brain trust. Every team in this division has sizable flaws, so the Cubs could keep things interesting for a while if they get bounce-back seasons for a few hitters who slumped last year, plus competitive starting pitching. Even if they fare worse than that, bolstering the farm system with trades for veterans would be a good result for a team looking beyond 2012. A contract extension for Garza could be an intriguing option too, if the price weren’t too high. 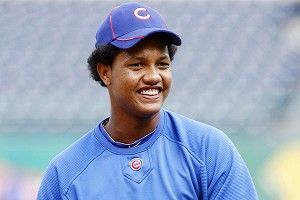 The team’s best trade chips struggle or get hurt, making it tough for the Cubs to get promising talent in return. Castro’s defense not getting better would also be a painful outcome, given he’s their best shot at a star among the position players on the major league roster.